Hello, What’s up, How are you doing? If you’re reading this then you must be curious about who I am. We’ll I’m a LifeStyle Artist that uses multiple mediums to create my art. Therefore, sometimes I’m a painter, sculptor, graphic designer, fashion designer, author, director, music producer, inventor, programmer or creative business strategist. I’ve been using these multiple mediums to work with some of the top entertainment companies and celebrities in the entertainment industry for the past 15 years. 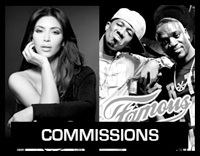 If you want to see some of my previous work please checkout my commissions page. Currently, I’m focused on designing opportunities and art projects that helps other creative individuals recreate my success and better their lifestyle. As a music engineer, I worked on albums with music artists like Da Brat, Mariah Carey, Bone Thugs-N-Harmony, Snoop Dogg and Tha Dogg Pound, Omarion, Bow Wow, Lloyd and Nelly. As a music producer, I produced songs for artists such as Jill Scott and Rap-A-Lot Records rap group Do or Die and many more.